Having limited space in your home involves some planning to create the atmosphere of spaciousness and airiness. A range of ideas that involves color coordination and rearranging can help solve this problem. This article lists some easy and clever ideas that will help make your home appear more spacious. Remember, a tiny room doesn't have to hold only tiny furniture. Sometimes with a small space, people avoid large furniture thinking it will dominate the room. Not true. 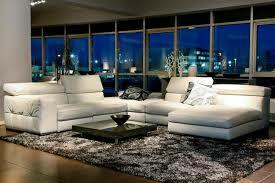 A large sectional can often be better than a small sofa and chair. Making a small space seem grand depends on maximizing light. You can do that with a glass coffee table, rather than a wood or opaque one. You can do it by tucking mirrors into corners, and by hanging art in glass frames, which create reflections. Hang curtains so that when they're open, the entire pane is clear; open curtains should fall beside the window and not obscure any of it. Don't hang curtains inside the window frame. Consider hanging curtains from the ceiling, rather than from the top of the window, which will add height (and some drama) to the space. Whether you're hanging art or shelves, or placing furniture, don't let vertical space go to waste. Using it is practical, providing a display space for art, for example, and it also draws the eye up, making a space feel more expansive than it actually is. •	Light-colored cabinets, open shelves and glass-front doors will help to lighten a space. Too many cabinets, especially made of dark materials, will give the impression that the room is much smaller than it actually is. You can also add pullout shelves, rotating inserts and tilt-out bins. •	Use the inside of cupboard doors. If covered with magnetic paint, they can accommodate papers and notes that might get knocked off a fridge in a small space. •	Fill a cleaning caddy with supplies that can be stored in the kitchen, but transported around the house. This eliminates the need for cleaning supplies in multiple rooms, like the basement and bathroom, saving space in each. - Use a wall file system to organize documents. This will get them off your work surface, but keep them visible and handy. - Consider redesigned wall bed/shelf/desk combinations. The bed and desk fold into the wall leaving the room clear when you need the space. They also work well in a spare bedroom. - Get a paper shredder. And in a small space, make it a habit to shred as soon as mail comes in. That way, there's no backlog. •	You can make a compact room feel much bigger by choosing a few large, bold pieces rather than several smaller ones. And keep the main furnishings in proportion to each other. •	Avoid bold patterns or overstuffed furniture with thick arms. Streamlined pieces, such as armless chairs, are beautiful space savers. •	Hang your flat screen TV on a flexible arm. This eliminates the need for a TV stand or entertainment unit. - Get rid of any visual obstructions: Trade a frosted-glass bath or shower door for a clear glass one. You can also eliminate the door altogether and hang a shower curtain that can be pushed to one side when not in use. - Hang shelves above the toilet. Use decorative boxes on the shelves to contain/hide the clutter. Label the boxes so that everything is easy to find, or so that each person in the household can have their own box. - Wallpaper isn't just on-trend, it's practical too. In narrow hallways, wallpaper can draw the eye away from the length of the space and create the illusion of width. Just remember: a small space isn't a place for high-contrast color or patterns. Go for tone-on-tone papers. - Work the lateral space. By adding a second rod inside a closet, you can double your hanging space. Hanging cubby shelves attached to the rod can add space for sweaters, shoes and hats. - Made-to-measure closet systems can be affordable. And systems from Storables or the Container Store can be dismantled if you want to take them with you when you move. With these smart solutions, you can make your small space look and feel larger than it actually is. We hope these ideas will bring inspiration and help with your future projects.